A century-old brand and a camper manufacturer for over thirty years! The company manufactured radiators, reservoirs and automobile bodies in the Paris area. Following World War II, most French schoolchildren were transported in CHAUSSON buses; today, many of them are camper fans. The ODYSSEE 4000 is presented at the Paris Automobile Show. CHAUSSON is the first car manufacturer to “”dare”” WHITE bodywork and success is immediate. TRIGANO acquires a 49% stake in the company. A new product and sales policy is implemented; this centered on the “”right price”” approach, which is still valid today. The goal is to promote usefulness over excess and find the right balance between equipment and price. 1995: CHAUSSON makes campers available to a larger audience by offering a limited series of “”Welcome”” overcabs with prices starting at 177,900 French francs (around €27,000). 1997: After the entry-level overcab, CHAUSSON inaugurates the low profile basic equipment camper by creating the WELCOME 70. This was a best seller for many years and today over 3000 of these vehicles travel the highways. Still very much appreciated, the Welcome 70 has become a reference on the market for second-hand campers. Its double-layered polyester roof and original design soon made it a popular low profile reference in Europe. It received an award from the Observatoire du Design in 2002. Presentation of the Welcome 60, a low profile less than 6 m long, with basic equipment, bunk beds in the rear and a roof bed in front. 2002: TRIGANO VDL focuses on continuous improvement and long-lasting vehicle quality and obtains ISO 9001 quality certification. Today, the company continues its efforts to maintain this prestigious label and ensure the high quality that CHAUSSON customers have a right to expect. 2005: New FLASH line, back to a favorite. 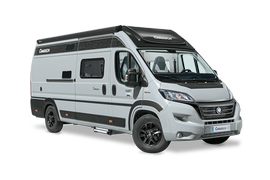 CHAUSSON reinvents the basic equipment camper and offers two spring models: an overcab and a low profile. They sold out in two weeks. Today, the full FLASH line is a real favorite of camping car fans. This is how the European press described the vehicle. The Welcome SWEET is the first low profile compact (5.99 m) to offer a central kitchen along with an electrically controlled double bed and an immense bathroom. As a result of its success throughout Europe, SWEET became a full line in 2010. 2010: The SWEET receives a European Design Award. This prize honors major innovations in the camping-caravaning area. It is awarded by a jury composed of representatives of 12 European magazines specialized in recreational vehicles. in less than six meters, there is a maxi lounge area (for up to seven! ), a maxi refrigerator (145 L), a maxi bathroom and a two-position electric roof bed, all at a FLASH price. An immediate success throughout Europe, the FLASH 10 is elected compact of the year in England. 2012 : CHAUSSON presents the integral camper at an affordable price and previews the EXALTIS I-778 at the Paris-Le Bourget show. After this successful launch, EXALTIS becomes a separate line the following year with three models featuring an identical front area and independent shower. The rear sleeping area offers three variations: I-774 with a spacious garage, I-777 with twin beds and I-778 with a central bed. 2012: The SWEET camper with the highly innovative PANORAMIC SYSTEM makes its market debut. This system, which opens a panoramic vista on the left side of the camper, won a Caravaning Design Award at DUSSELDORF. 2013: Launch of the WELCOME 69 with a layout which is unique on the market: In a low-profile camper (with a roof bed) under seven meters, CHAUSSON combines a “French-style” bed with a comfortable independent shower without reducing the roominess of the lounge or kitchen areas. 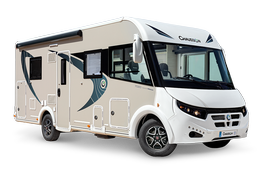 The enthusiasm for this new model in the fall shows encourages CHAUSSON to include this layout in the TITANIUM limited series in the spring of 2013. During the past thirty years, CHAUSSON has also proposed an LPG carrier, double flooring, a low profile with a fold-away bed and an integral. During your vacation, you’ll be certain to cross the path one of the 45,000 vehicles that have built the CHAUSSON reputation. With this exceptional background and one of the most modern production units in Europe, CHAUSSON joins camper fans and company dealers throughout Europe in looking toward the future with confidence, enthusiasm and passion.